New Version of Timeline 3D for iOS! Both versions have the same price and functionality when all the features are unlocked. All customers who previously purchased Timeline 3D for iOS will be automatically upgraded to the “Education Edition” so that all features will continue to work (including the new features) without any additional purchase required. New customers are encouraged to try the free version of Timeline 3D for iOS. It allows you to create, edit, save, and present timelines at no cost. If you choose to export a rendered timeline chart (print, PDF, movie, slideshow, etc…) then you can add that functionality with an in-app purchase. If you are a long-time customer of the Mac version of our software, there has never been a better time to try out the iOS version too! In addition to these great features, this update also represents a major re-architecture of the code to bring the iOS and macOS versions of Timeline 3D into a common code base. That means that it will be easier for me to keep them both up-to-day with the latest Apple technologies as well as making simultaneous improvements across platforms. Because this new update has so many changes, some of which change the format of user data, I am planning to beta test it a few weeks on TestFlight before releasing. If you'd like to join the beta test, please send us an email at support@beedocs.com. I am pleased to announce the release and immediate availability of Timeline 3D for Mac (v5), a significant update to our award-winning timeline software for Mac OS X. Completely redesigned for OS X Yosemite, Timeline 3D provides a new interface to support the creation of larger and more complex timelines. Timeline 3D helps present chronologies and historical events in full screen and with a 3D perspective. We also launched our new website and updated help documentation to support the new version. I encourage you to send feedback to me at support@beedocs.com. I look forward to hearing what you think of the new version. Cheers! This weekend, I released the second beta for the new Timeline 3D for OS Yosemite. Please replace the previous beta and give it a spin. I appreciate your feedback at support@beedocs.com! IMPROVED: Timelines display sharper text and images when zoomed in 3D renders. IMPROVED: Code signed so that you won’t get Gatekeeper warnings during first launch. 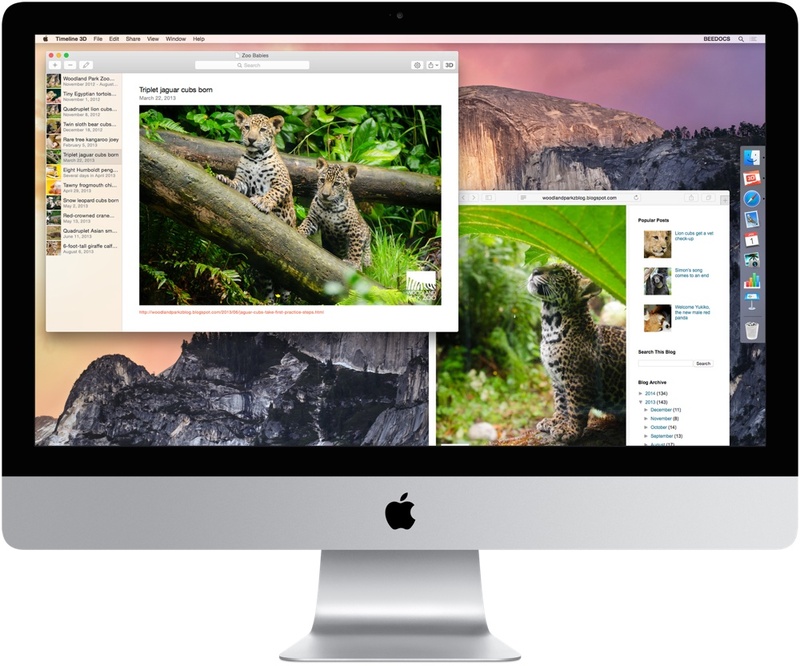 Last week, Apple released OS X Yosemite and I published the first beta of new the new Timeline 3D for OS X Yosemite. After you upgrade your Mac, please try the new Timeline 3D. The beta will be free while I iron out the bugs and put the finishing touches on the iOS 8 product that goes with it. This is a good time to send me feedback about any bugs you find. The new version is an almost complete rewrite of the code base (the last rewrite of this scale was the “T2” release back in 2007). I have been working on this release for about three years. Some of the features have found their way into the iOS releases during that time. A few people asked for more details on why a rewrite was necessary. The main reason is that the iOS version and the Mac version of Timeline 3D shared about 5% of their code base and the other 95% was different for each platform. This is because the Mac version was written before iOS existed and many of it’s technologies are not available on iOS. It is difficult for me to develop new features and fix bugs when the products are completely different behind the scenes. The new versions have about 85% of the code in common. All of the date parsing, document storage, layout, rendering, and exporting code is now common. For example, when I recently improved the way date parsing works in Chinese, that improvement was applied to both platforms. In this effort, and also in the effort to remove my dependence on technologies that have been deprecated or fallen out of favor, I swapped out many of the core technologies for newer technologies. Obviously, the user interface has changed quite a bit too. I’ve discussed some of those changes on this blog. The main idea behind the changes is to address the most common issues customers have as well and standardizing on a user interface that can scale from phones to 5k iMacs. If you have any questions or concerns about the new version, please send me an e-mail. I realize that it will be a transition and will cause some inconvenience, but I hope that the new architecture will serve us all well for the next 5-10 years. 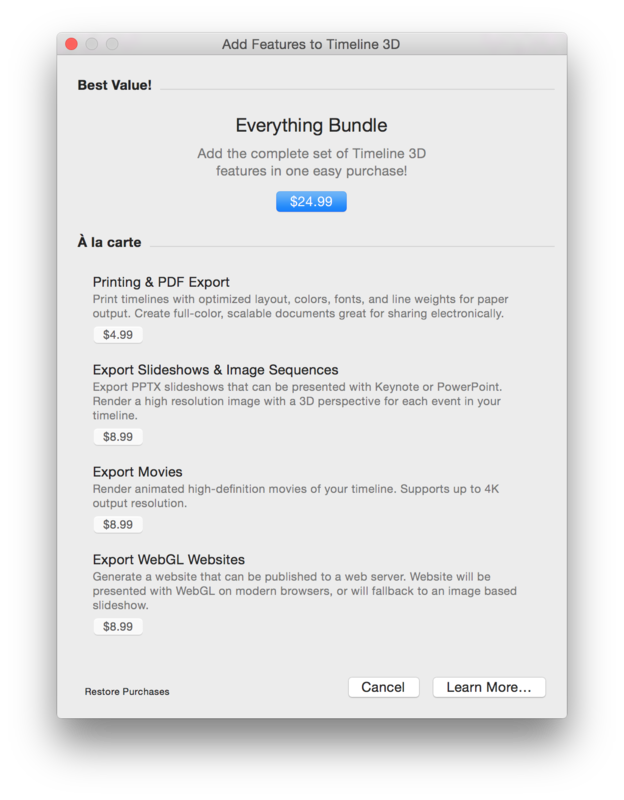 When I announced the new versions of Timeline 3D, I received a lot of feedback about pricing. Thank you to everyone who sent a thoughtful reply. I enjoyed interacting with you and if helped refine my thinking. I described the new pricing model as “freemium” and described an option to pay a small fee per export. Even though I also described an option to pay one price to unlock everything, the “freemium” description caused a bit of panic. Allow most customers to unlock the complete set of features for a reasonable price. Give less expensive options to people who only want to use Timeline 3D for one particular project (like a school project). Unlocking the exporting and rendering features require a purchase. The purchases will be handled as an in-app purchase. These are non-consumable purchases which means that unlocking a feature on one of my Macs will allow you to unlock the feature on all your Macs that are using the same Apple ID or family sharing. Timeline 3D for iOS will contain a separate but similar pricing arrangement. If you've already purchased Timeline 3D for iOS, you will not need to pay again. Here is the pricing sheet for the Timeline 3D for OS X Yosemite launch. The prices are subject to change in the future. I know that education and enterprise customers are interested in a paid up-front version so that they can purchase and install Timeline 3D in bulk. I am working on a solution to that as well. Hopefully the new pricing arrangement seems clear and fair. If you have questions or feedback, please send me an e-mail at support@beedocs.com.